Like All Saints', Martock, this is another Perpendicular church showing a loose affinity with A.K. Wickham's "Quantock Group" (see the entry on St. Mary's church, Bishop Lydeard for an explanation), although unlike All Saints', this is a building that is only of the second rank. The tower (shown left) has real nobility, however, and in its desolate location in the Somerset Levels - next to the ruins of Muchelney Abbey (shown in the photograph at the foot of the page) and beside the River Parrett - it is an attractive landmark for miles around. Constructed largely of blue lias, which is certainly blue here in the walls of the chancel but more a whitish-grey in the tower, it rises in three stages to battlements punctuated by short pinnacles in lines of three at the corners and further pinnacles at the centre of each wall, supported by angle buttresses to the lower two stages and with a projecting octagonal stair turret to the southeast. The transomed W. window has ogee lights subarcuated above the outer pairs, alternate tracery with subreticulation and through-reticulation, and a supertransom crossing between the supermullions rising from the apices of lights 2 & 4. The W. doorway has a finely moulded surround and an order of bowtells with capitals, all set beneath a label. 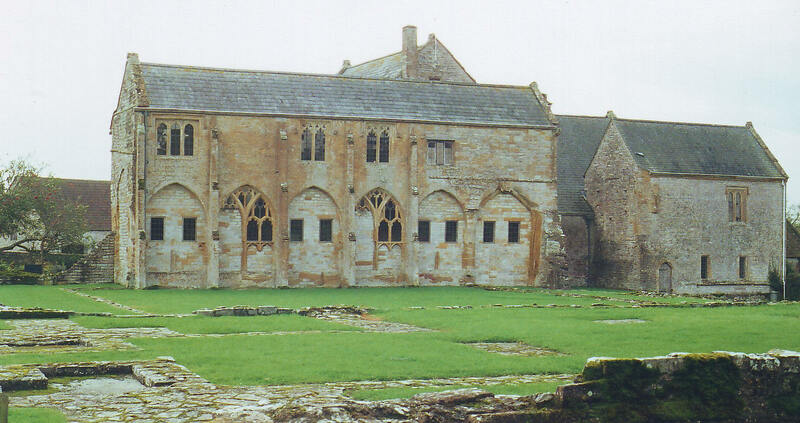 The building continues eastwards with a three-bay aisled nave with a two-storeyed N. porch and opposite, to balance the design, what was probably once a cross-gabled mediaeval S. vestry and is now an organ chamber. The chancel has a short chapel on either side, which differ from one another, beyond which the sanctuary projects a further bay to the east. The windows are mostly two-light with simple alternate tracery, but the south and east windows to the S. chapel are three-light and subreticulated, the chancel S. window is similar except that it includes two tiers of subreticulation, and the chancel E. window (above right) is comparable to the last except in having five lights and a supertransom which, again, crosses between lights 2 & 4. 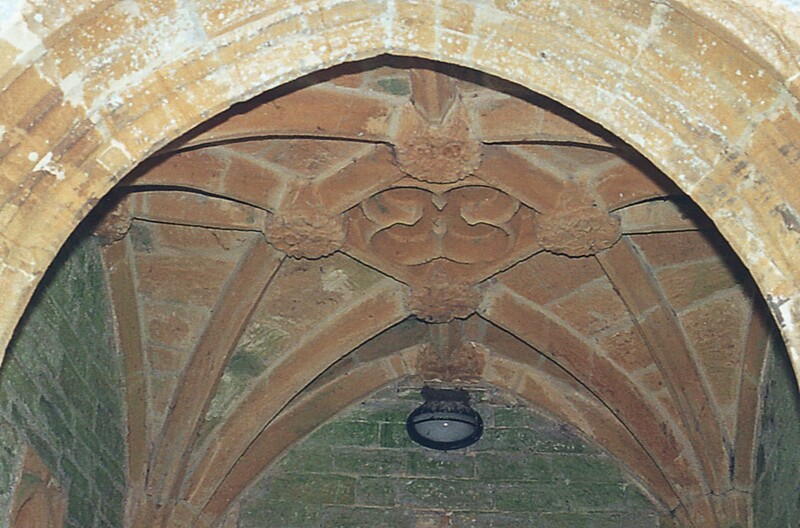 The S. porch has battlements bearing blank quatrefoils, and an outer doorway with fine mouldings and clusters of three shafts on either side, with small capitals carved with leaf decoration. Inside, a lierne vault (shown left) supports the room in the upper storey. Unfortunately after all this, the church interior is less pleasing for it is evident there has been a good deal of incompetent patching up down the centuries. The three-bay nave arcades with piers composed of four shafts separated by wave mouldings, appear to be of early fifteenth century date. The chancel arch is similar but taller, but the arches from the aisles to the chapels, from the chancel to the chapels, from the N. aisle to the organ chamber, and from the nave to the tower, are all decorated with shafts at the angles and panelled soffits in the manner also to be seen at St. Mary’s, Chard, St. George’s, Hinton St. George, Holy Trinity, Long Sutton, All Saints, Martock and St. Mary’s, Norton-sub-Hamdon, where the work is so closely related, it seems certain the same mason was involved in at least some of them. The fan vault beneath the tower could perhaps date from the late sixteenth or seventeenth centuries. However, here at Muchelney some of this work is cumbersome and even ugly in execution, and it does not always inspire much confidence in its authenticity.